What is the best way to visualize four or more data points on a graph? The graph will show the four data points for each day (e.g. 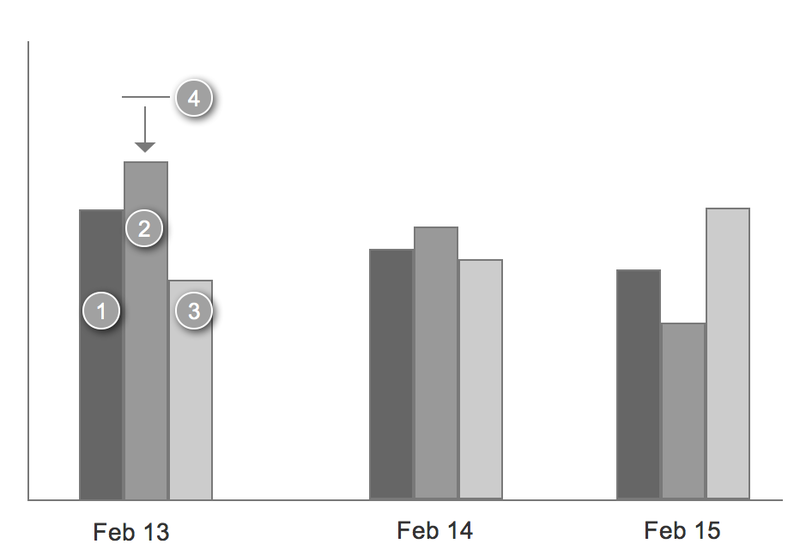 Feb 13th) and there will be up to 31 days on the graph at a time. Each day should be on the x axis. This is for browser-based software used by forecast analysts. Specifics: One data point will never change, it is "last year's data point." The 2nd data point will be manipulated up and down by the user. The third data point will automatically re-adjust, decrementing/incrementing when the user increments/decrements the 2nd data point. The fourth data point only appears after the user has moved the 2nd data point, as a reference to where the data point started (so users can easily see what adjustments they've made). Please reply with a wireframe or visual mockup in your answer. Why not use a line graph with marked points? If you're allowing the graph to be manipulated, you should include guide lines for the y-axis too, provided that the manipulations are in integers.